Murshidabad is situated on the banks of the Bhagirathi River, north of Calcutta in West Bengal. 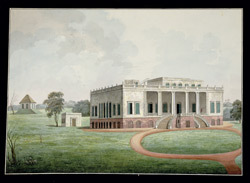 In 1704, the Nawab of Bengal transferred his capital here from Dacca; in 1757 a series of military disputes between the Nawab and the English East India Company resulted in the rise of English supremacy in Bengal. Although the town of Murshidabad continued to house the residence of the Nawab, it was no longer a place of political power. David Anstruther served in the Bengal cavalry from 1778 to 1794, when he resigned from the service.